"This isn't science fiction, this is science fact." For a moment, Cubby Broccoli had me convinced of that. But I learned a harsh truth: the Bond films aren't always obedient to the laws of Newton, Einstein or Maxwell. And sometimes they have an actor say a line that's so utterly ridiculous, one cannot decide between laughter or sadness. - It's a highly toxic nerve gas that has no effect on animals. - May I see the formula? - It's the chemical formula of a plant. - Orchidae nigra. A very rare orchid indeed. - Thought to be extinct. "The chemical formula of a plant." Science 1.0.1 will tell you that plants are a collection of cells and fluids, with each cell itself a collection of a many different molecules. Every molecule has its own formula, therefore "the chemical formula of a plant" is a little like "the phone number of New York": it doesn't exist. Even if the screenwriters felt an urge to simplify things for the sake of keeping movie science accessible to all, what we have here makes no darn sense - period. Had they written, "It's the chemical formule of a compound that can be found in only one plant. ", it would have been perfectly fine. Unless of course you want to examine the formula more closely. I'm not a scientist, but I've always wondered about that GE jump off the cliff in the pretitles to catch the plane. Is that even possible under the laws of physics? It seemed a little far fetched then and still does now. I mean, look at the distance between them here! When I saw Goldeneye for the first time at the cinema, people actually laughed out loud at that stunt. When the audience laughs instead of gasps, you know you have crossed the line. 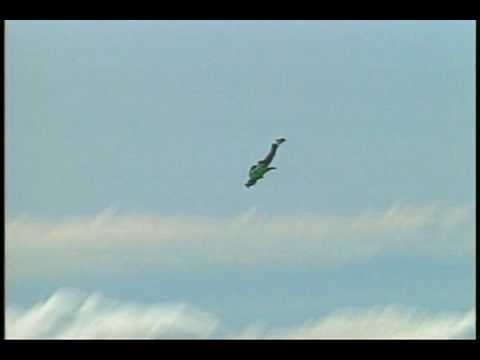 However, just to add, the prop could have been spinning as an effect of the air passing thought it (rather than force from the engine) and as such it would create a lot of drag and slow the fall of the aircraft. I am not sure of its poor back projection or the concept that makes it a laughing matter. You are correct, sir. It's implausible for sure; moreover, it's impossible too. The plane started falling somewhat sooner than Bond but gains speed very fast. Per second, a falling object gains approximately 10 m/s. And since neither of both is in a particular aerodynamic disadvantage, I don't think wind resistance counts for much. Also, the plane has a far larger horizontal velocity compared to Bond; Bond would have to jump a lot further to ever catch this plane. And then there's the question of whether or not Bond can pull up the plane in such a vertical dive with so little horizontal space - or so it seems - to make that U-turn. and since then it's been done more often. However, there's an important point here, and that's the hight at which this all happens in the film. on average the falling speed is 55m/s. So, if the hight of the cliff was 1000 meters, which is pretty highe, It could take a maximum of 10 seconds to get into the plane, as you'd need probably another 10 seconds to level it out. That's increadably short. and then you have the point as you state with the horizontal distance. I'm not quite sure that would work. People moan about the invisible car (yes, I do too), but how about those x-ray specs? Did he find the ad in a Donald Duck magazine from the 70s"
Thanks @DarthDimi, @CommanderRoss (that is a fantastic video). come on... we all know E=MC³ means you can travel back in time...... or have none of you seen Kung Fury yet???? Why, in TWINE, when Bond fires his gun at the glass door between him and Renard (in the pipeline station), the bullet takes several seconds to hit the glass, despite Bond being just next to it? I'm no gun expert but don't bullets fly very fast? thats the physics of editing lol.. Bond's bullet deflecting watching watch in LALD. Mythbusters tried to recreate it, and there's just no way a reasonably sized magnet affects a bullet. Moreover, the strength of a magnetic field degrades very rapidly with the increase in distance, so attracting that shark bullet to his watch was almost certainly impossible too. Also, shooting a gun in a plan doesn't result in catastrophic depressurization nor can you die from skin suffocation. well i love the accepted notion that DAD presented, of it being basically an out-patient procedure to completely change a person's DNA, their bone structure, their overall appearance, as well as their voice and ethnicity over a weekend in Cuba.... bending the laws of known science to make duplicates of yourself via plastic surgery in DAF was pushing the believability envelope a little too far - and that's even by today's modern science standards... but the whole gene therapy nonsense in DAD makes the plastic surgery in DAF look completely believable by comparison. Bond will travel to 1930, find A. Hitler, shoot him six times, reload, then shoot him six times again, return to an alternate 'present day' and retire peacefully. I also always thought it was quite unrealistic that Bond was able to focus on certain objects (M's spoon for instance) without pulling everything else towards him as well. Anyway, for those who are interested, I came across this interesting book on the physics of Bond gadgets/stunts etc. There are a few pages you can skim through via google books. Seems like an interesting book......I may pick up a copy at some point. The laser watches of NSNA and GE were pretty much impossible in those days. Somebody created one a few years ago (I posted the video), but even then, it's just good for blowing up balloons, not cutting through steel. When I saw Goldeneye for the first time at the cinema, people actually laughed out loud at that stunt. I distinctly recall the audience cheering at the first screening I attended. It had been a while since the last movie, and people were just itching for something ridiculously, and quintessentially, "Bond". My aunt told me, "you are about to witness the most AWESOME stunt EVER performed!" 13 Year old me didn't know better, made a fist and yelled, "yeah!". Ditto. That was before the dark times, before the empire, before... Bond fans became affected. There was so much pent-up demand for GE that appealing to the laws of physics was really not necessary. Anything was acceptable, we wanted Bond back so much after 6 yrs. After that, we (fans and the public) came back down to earth and became a little more discerning. EON/MGM took a while to catch on.